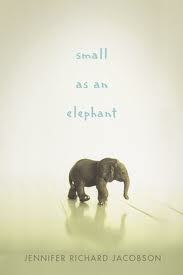 I found Small As An Elephant to be a very witty and comical book. Jennifer Richardson has written a great story about a boy and his adventures when separated from his mother. The author describes well the momentary feeling of panic that Jack feels when he finds that his mother is gone, and the reader can relate to that. Jack is a boy who is very fond of elephants. One time, he and his mother are driving to a campsite and Jack sees a sign for a circus elephant named Lydia. He asks his mother if they can go see the elephant. When the answer is a resolute “no,” and Jack’s mother keeps driving, he is very disappointed. By the time they reach the campsite, Jack’s mom is very annoyed with him. Jack goes to sleep, and when he wakes up the next morning he finds his mother gone (again). Jack sets out to look for his mother and on the way, tells lies, makes friends, and runs from just about everyone on the planet. Jack hides in places and tries to keep moving but he know that his grandmother is offering a big reward for anyone who finds him. Jack knows that eventually someone is going to find him. This book is about Jack’s journey to find his mother, see Lydia, and somehow not be found by the police.